You can do it all with our beautiful veneers! We would love to help you create a uniform smile with dental veneers at Mint Leaf Dental. Veneers are thin-layered porcelain or ceramic placed over the top layer of the teeth. They cover up aesthetic issues and make your smile look faultless. Our lab designs and customizes your dental veneers based on your unique needs. We only use top-of-the-line materials that look identical to natural teeth. Dental veneers can change the shape or size of your original teeth. They can eliminate staining or brighten hard-to-whiten teeth to make your smile sparkle! They can even work for orthodontic purposes by closing unsightly gaps and covering up crookedness. Best of all, they can do all of this at once. Not only do veneers give you a beautiful smile, they also protect weak or damaged teeth. They are resistant to decay and staining. 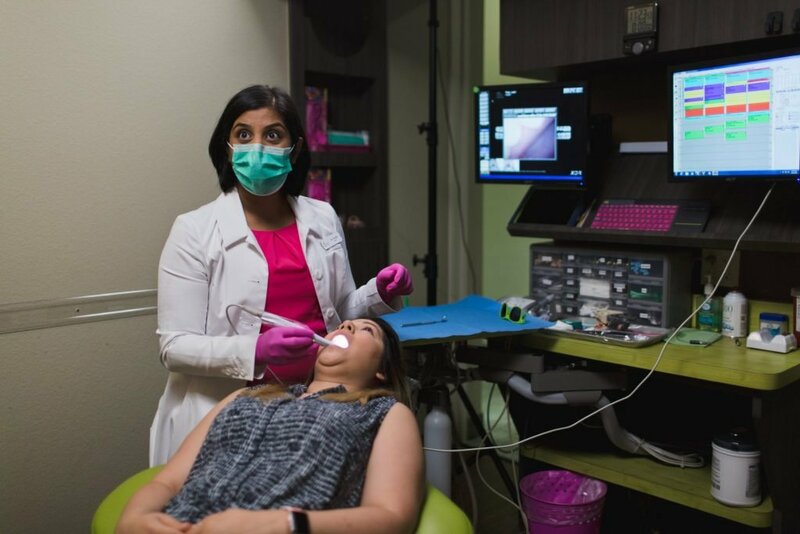 The Planning Stage: Visit Mint Leaf Dental so we can talk about what you want for your smile! We will take photos of your teeth from every angle and we may complete an x-ray. Veneer Preparation: Your dentist will remove a small amount of enamel from the desired tooth to make space for your dental veneer. Our laboratory will build your custom dental veneer. Trial and Placement: Before we place your veneer, we will check its shape, size, and fit. If you and your cosmetic dentist are pleased with the new veneer, he will permanently seal it to the tooth. Tired of seeing chipped or discolored teeth? Contact Mint Leaf Dental for a fast and beautiful solution!